NEWARK, N.J. — Nydresha is a small girl with big dreams about Hawaii. In her dreams, the 12-year-old and her mother live in a beach house. There is peace, and there is quiet. There is no drama, no abandoned houses and no cursing — not even by Nydresha herself. She curses sometimes in real life but always feels badly about it afterwards. And so Nydresha is staying put in her hometown, where she finished sixth grade last month at Quitman Street Renew School. Serving 600 students in pre-kindergarten through eighth grade, Quitman is part of a reform effort in a school district where petty, energy-draining bickering — the “drama” of Nydresha’s world — recently has extended to high-ranking officials. Newark’s embattled superintendent, Cami Anderson, stopped attending school board meetings this year because the acrimony has gotten so out of control. Some regarded a nationally watched mayoral election in May as a referendum on her leadership, even though the state runs Newark’s schools. The new mayor would like to see Anderson ousted and charter school expansion halted, but those aren’t his decisions. How to turn around failing public schools is one of the most vexing and pressing questions in American society today, and two years ago, Anderson tapped Quitman to take part in Newark’s attempt at solving the problem. The idea was to lift the school and others from the ranks of New Jersey’s lowest performers by giving exceptional principals the power to hire great teachers as well as extra technology and other resources. And while that strategy might still bear fruit, the reality at Quitman has proven to be messy and complex, as public policies intersect with private lives. Today, the school’s fate is still up in the air. 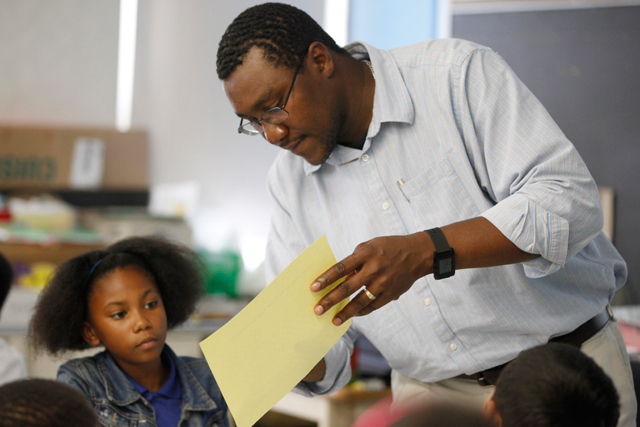 A weary Glover and his staff are waiting to see the impact of their toils — in terms of test scores and, more importantly, life prospects of their students, who are predominantly African-American and living in poverty. Nydresha, whose last name is being withheld for her protection, is at a delicate turning point, too. She has reached a paradoxical age where she still looks like a child — she has yet to reach 5 feet tall and thinks she weighs somewhere between 60 and 70 pounds — but her decisions carry increasingly grown-up consequences. Last winter, Nydresha wanted to be a lawyer because she liked the idea of defending the innocent, but then she decided, based on courtroom TV, that people who do wrong should fend for themselves. Her aspirations in the past six months have included fashion designer, mystery writer, video editor, “someone who works with animals” and, most recently, radio talk show host. She fiercely loves her mother, who has Nydresha’s name and a heart tattooed on her neck, yet longs for more attention from her dad, who is busy with two younger daughters from another relationship but still sees her frequently. She talks simultaneously of her desire to move, if not to Hawaii, “somewhere far, far away” and of having at Quitman “the most coolest, supportive friends ever,” as she described classmates Aliyah, Sarah, Keysha, Ashanti, Princess, Nyasia and Gloria in an English essay. Deeply impressionable, self-conscious, loving and social, Nydresha is a child whose future is as unpredictable as her school’s, and the principal wants badly to steer her toward a positive course. Engagement in constructive extracurricular activities often helps guide young adolescents toward good choices, and through the years Nydresha has dabbled in many of Quitman’s after-school offerings. The one that stuck was cheerleading. 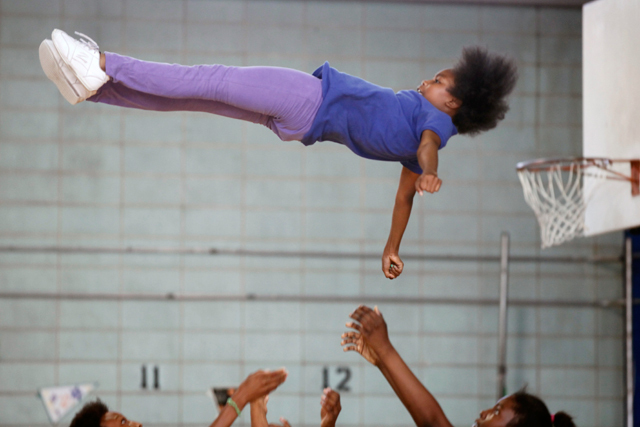 The most difficult of the stunts, called the yo-yo, involved three other girls throwing Nydresha up to dive face first toward the floor into a somersault. None of the other 18 teams performing in the tournament would dare to even attempt it. For Quitman to win, Nydresha would have to land on her feet, over and over again. But whether or not that happened wasn’t entirely up to her. The coordination of each of the other girls played a part. In the early days of the season, Nydresha’s mother was furious when she fell on the hard floor and hurt her back, informing the coaches that Nydresha would quit if they couldn’t provide a mat for her to practice on. The week before the June 7 tournament, Nydresha was thrown so high she whacked her right elbow into the ceiling of the Quitman music room. Her situation was, in many ways, emblematic of her school itself. Quitman’s teachers and administrators are responsible for student performance that is a result of both their instruction and leadership and a million other factors beyond their control, like whether someone’s father went to jail or there was enough food on the dinner table. However the pieces fall, they, and she, put themselves on the line. Erskine Glover will remember the 2013-2014 academic year as “the year of FMLA.” The acronym stands for Family and Medical Leave Act, the federal law that entitles employees to a job-protected leave to take care of serious medical conditions, newborn children and ailing relatives. More times than Glover cares to recall in the past year, he signed the FMLA paperwork for a staff member to take time off. The fourth-grade math and science teacher was out the last three months of the year after falling and tearing a ligament in her knee, making her unable to climb the stairs to her third-floor classroom. The vice principal left a month early for surgery to reconstruct her foot and ankle. The social worker had a baby. A prekindergarten teacher’s husband died. Nydresha’s English teacher missed much of the year due to hypertension and surgery to remove what turned out to be a benign tumor. Then there was Glover himself, missing days to care for his wife when she fell ill and had debilitating sciatica. This summer, he had resurfacing surgery on his right hip, less than a year after another operation to have his left hip replaced. FMLA is necessary, Glover knows, but the absences frustrated him as they interrupted classroom progress. Two school years ago, growth was stunted by five teachers quitting midyear, primarily due to job-related stresses. For the most part this past year, the coming and going wasn’t anyone’s fault. It just was what it was — with a few unfortunate exceptions. In May, Glover and a new seventh- and eighth-grade science teacher mutually agreed for the teacher to leave because he couldn’t control his classroom. In early June, Nydresha’s homeroom and social studies teacher was placed on paid leave pending the investigation of a misconduct allegation. According to Nydresha, not much learning occurred after that in social studies, which had been one of her two favorite subjects, along with English. On the third-to-last day of school, with many of her classmates absent, she and six other kids sat watching skydiving on television, followed by a show on Guinness World Records for things like the longest wedding dress train (4,468 feet at the time of the filming). Earlier in the year, she had enjoyed learning about ancient Greece and Egypt. Despite the disruptions, Quitman’s climate is generally one of people working incredibly hard. Beginning at 8 a.m. and ending at 3:30 p.m., the academic day is a full hour longer than in most U.S. schools. Many students come early for breakfast, and through early June, about 80 of 100 students targeted for tutoring would stay at school until 5 p.m. The school offers activities including track, basketball, art club, music club, technology club and archery club. But even with all that, Glover still has what he refers to as his “5 p.m. to 7 a.m. problem.” During that 14-hour span, he has students facing every societal challenge imaginable, detracting from their ability to learn. One morning when a child had an emotional meltdown so severe he had to be taken from Quitman in an ambulance, the saddest part to Glover was that it was just another day. The staff isn’t immune, either. A teacher’s aide from the neighborhood moved away midyear after being shot in the hand and leg last fall while out with her brother, who was caught up in a dispute. That’s why Nydresha would like to move to Hawaii, though she worries about the possibility of a tsunami there. Student safety in Newark is far from assured, but when Glover stays up nights worrying, he doesn’t let himself dwell there simply because he can’t do anything about it. Besides, most kids have someone at home who loves them and is looking out for their well-being, he said. But when it comes to sharpening students’ minds during their 14 hours away from school, the principal could use some reinforcement. Are the children spending their time hanging out, playing video games, on social media and watching television, or are they doing homework and engaging in activities that will brighten their future prospects? That is the question that eats at him, and the answer is one he believes holds Quitman back. 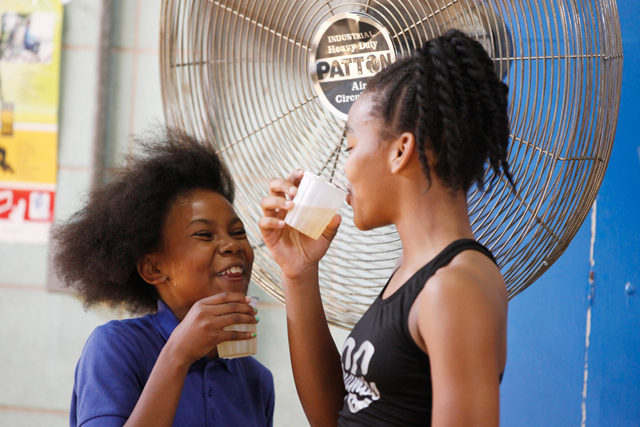 In school, one of the girls on Nydresha’s “most coolest, supportive friends” list is a cheerleading teammate named Sarah. Although Sarah is still 11, one of the youngest kids in their grade, she is a full head taller than Nydresha and appears even more so with her trademark high ponytail. Sarah doesn’t have time for hanging out like Nydresha and most of the other kids in their grade. In addition to being a Quitman cheerleader, she is a member of a traveling All Star cheerleading team based in Waldwick, a suburb 25 miles north of Newark. She is also on a tumbling team and has in the past done a Double Dutch team; whether or not she continues with Double Dutch in the coming season will depend on the practice schedule, as she has not yet been able to figure out how to be in two places at once. She had to drop a second competitive cheerleading team this summer because of a scheduling conflict. For the All Star cheerleading and tumbling, Sarah is coached by Rayshine Harris, a Newark native who went on to become a 12-time tumbling world champion. She dreams of being like him, and most nights the past school year, she had All Star practice until 9 p.m., getting home around 10. Tumbling practice was on Saturdays and All Star cheerleading was Sundays. The summer brings more All Star practice, and Sarah plans to fit in a separate cheer camp and Double Dutch camp, as she has in years past. All of this is made possible by Sarah’s sleep-deprived mother, Andrea, who works an overnight shift as a parking lot attendant at Newark Liberty International Airport. (Parents in this story are also being referred to by their first names to protect their children’s identities.) Andrea goes to work at 10:30 p.m., leaving Sarah and her 7-year-old sister alone while they sleep, with neighbors to call on if they need anything. She heads home at 6:30 a.m. to get them to school. The tradeoff is that Andrea is available to drive her daughters to sports practices. Her little one has taken to cheerleading and tumbling, too, and last year was the only second grader on the Quitman team, which otherwise consists of girls in third grade through eighth. The mother rests in the morning but often returns to Quitman to bring her daughters lunch. She also helps to fundraise for the All Star team’s travel expenses. Andrea, 43, said she enjoys living vicariously through her daughters. She wishes she could have done competitive cheerleading and tumbling herself as a girl, but her parents, immigrants from the West Indies, weren’t open to it, and besides, she didn’t know what was available. “I’m happy they’re able to do something I would have loved to have done at their age,” she said. Whenever an opportunity comes along for them to join one team or another, she can’t say no. The mother hopes the effort –Â hers and her daughters’ — will one day pay off in the form of college scholarships from cheerleading or gymnastics teams. In sixth grade, though, harder classwork combined with long practice hours took a toll on Sarah’s grades, which fell to B’s and C’s after years on Quitman’s honor roll. Sarah’s dedication and singular focus may be rare at Quitman, but her desire to make something of herself through athletics more than academics is not. Glover would never discourage athletic pursuits; he was a basketball player himself, and his own son hopes to play soccer in college. In himself and his son, though, he has demanded academic excellence as well. He tries to demand it of his students, too, and to get them to understand that success in school is a surefire route out of poverty, while success in sports is not. But he is up against powerful cultural forces, and every year, members of the team backing him up — the teachers and staff he counts on — are rotating in and out. While Nydresha and Sarah both excel in cheerleading, Nydresha does not share Sarah’s aspirations. “Tumbling / cheering IS LIFE,” Sarah wrote on the back of the memory book. Stephanie Ruff, the Quitman parent liaison and cheerleading coach, said if Nydresha wants to, she could have an “excellent career” cheering in high school. “Hopefully she don’t let the little boys distract her,” Ruff said. Nydresha was recommended for summer school after ending the year with D’s in English and science. She said her focus in class suffered in sixth grade because of a bullying situation, the bully being a boy who had an unreciprocated crush on her — until she cursed him out. Nydresha was born at 12:25 a.m. on Feb. 19, 2002. At 7 pounds 15 ounces, she was an average-sized newborn, but she has been a “little doll baby” ever since, according to Lil’ Bit, whose real name is also Andrea and who goes by Drea with family and friends. Drea, 43, said she didn’t know she was pregnant until she was four and a half months along. Her twin brother’s name is Andre, or Dre, and so her daughter would be Nydresha, Dresha for short. Drea once attended Quitman herself, and she dropped out of nearby Central High School in 12th grade. Until Nydresha was born, she said, she was “working, hanging out, enjoying myself.” Through the years she has worked as a barmaid, an airport maintenance worker and a deli cashier. She’s packed boxes in a warehouse and taken care of horses and goats at the Turtle Back Zoo, Nydresha’s favorite of her mom’s jobs. Now a school bus aide to disabled children, Drea leaves for work early during the academic year, Nydresha said, and calls to make sure Nydresha is awake at 6:30 a.m. An uncle who lives downstairs checks in on the girl as she’s getting ready. At 7:24 a.m. this past year, Nydresha would catch the No. 5 public bus to Quitman, arriving approximately 10 minutes later. At the end of the day, her mom would be there to watch her at cheerleading practice, and they would take the bus home together. Nydresha’s math teacher, Edwina Mitchell, demanded that her parents send her to after-school math tutoring after Nydresha missed more than a week of school for the Florida trip. She did not do her work while away and was failing math upon her return. Mitchell said she initially had trouble reaching Nydresha’s parents, but eventually they came around. “I felt like Nydresha didn’t take school seriously because the adults around her didn’t take school seriously,” said Mitchell, who also needs foot surgery but has been delaying it, not wanting to miss time with her students. 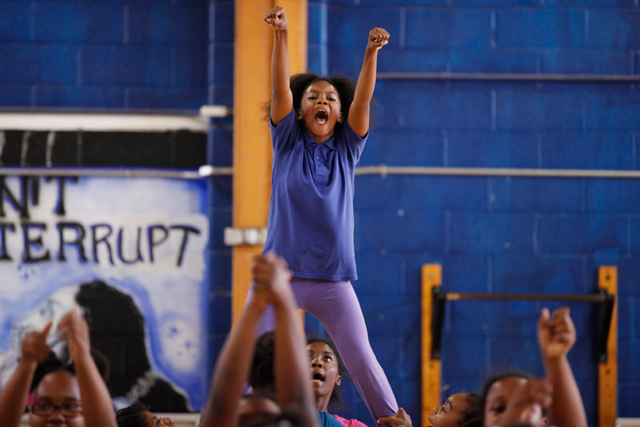 The teacher said that if Nydresha got the kind of encouragement in academics as she does in cheerleading, “she could go anywhere.” She wishes there were more academically-inclined extracurricular activities in the neighborhood. She once coached debate at another school and could see Nydresha being a natural at it, if she had the chance. At the same time, she said, cheerleading and other sports teams can provide students with a vital sense of belonging. “It models the family unit,” she said. “If you don’t stay on her, she gets kind of lazy,” said Darin, 48, a baggage crew chief for American Airlines. Someone else rooting for Nydresha is Wydeyah Hay, a 22-year-old Virginia State University student who comes home to Newark each May and volunteers to help the Quitman cheerleaders prepare for their annual tournament. (She is a childhood friend of the daughter of one of the Quitman coaches.) Hay also coaches the Brick City Lions. Working with Nydresha on that team, Hay saw what she was capable of. Back at Quitman, she tapped her to take on more stunts, more responsibility. That increased further when three girls who were among Quitman’s top performers were kicked off the school team for getting into a fight. Nydresha was ready to step up. In academics, in athletics, in life, competition motivates. Standardized tests aren’t competition per se, but everyone always looks to see how schools compare. And while Principal Glover wants student learning, not test scores, to drive what happens in his classrooms, he also hates being labeled a loser. Last year Quitman scored in the bottom 2 percent of schools in New Jersey on the state’s standardized exams. This year’s results are expected back in August. Internal assessments project that the school will make strong gains in reading and more modest growth in math. 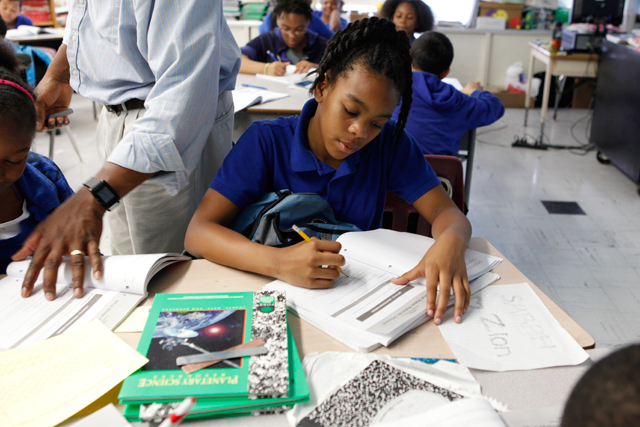 Nydresha was among the 100 students targeted for after-school tutoring the past year because their 2013 performance suggested that with the right intervention, they could get up to grade level and pass this time around. 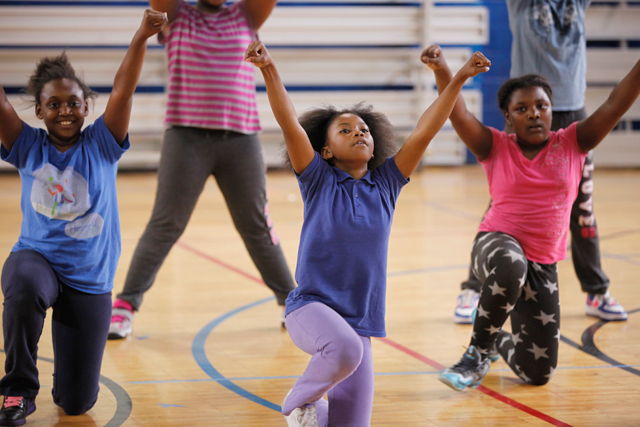 But Nydresha’s focus was on cheerleading practice. 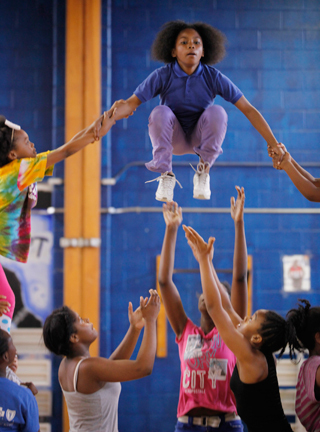 The state exams don’t carry personal consequences for students, but the Newark Public Schools’ annual elementary cheerleading tournament does. Nydresha and Sarah have been on the Quitman cheerleading team since third grade. Each year, they and their teammates begin practice in October and perform during the boys’ and girls’ basketball season. Then in early May, they stop attending games and train intensely for the annual citywide competition, not unlike the last-minute test-prep seen at many underperforming schools nationally. Hay joins the two cheerleading coaches each spring when she gets home from college. Her job is to choreograph a routine to win. Last year, the Quitman girls won second place in the upper division cheer and dance category. The school also scored four individual first-place awards, one of them for Sarah, who won the title Miss Yell. This year, more teams would be participating, and Quitman was bracing for stiff competition from Alexander Street School, which is being converted to a charter school this summer because of failing academic performance. Hay decided to include more and harder stunts than in years past. To pull them off, she would rely on Nydresha, the smallest of the middle school girls on the team. And she would require everyone to practice five days a week for two hours or more, a commitment that only 14 girls were able to keep, down from about 35 who started the season. The school also mandates that cheerleaders keep a minimum 2.0 GPA and good behavior. Nydresha at one point contemplated quitting to join the technology club, which produces the yearbook, but the technology teacher wouldn’t allow it. She told her she had to finish what she started. Nydresha’s seven stunts were spread throughout a tournament routine that included a 40-second performance to a music mix Hay made, a 50-second cheer and then another minute performing to the music, which included bits by Whitney Houston, Icona Pop, Rhianna and BeyoncÃ©. One Thursday in late May, at the 11th-to-last practice before the tournament, the pressure was palpable. Over and over, Hay made the girls repeat their routine until Nydresha, in turquoise shorts, could perfect the count to swing her leg around in a stunt called the pendulum. It involved doing a single-legged backbend while hoisted in the air and then whipping the lifted leg from behind her body to the front. She kept coming around on five-six and needed to wait for seven-eight. “You know if you bend your leg, you’re going straight to the floor,” Hay said. Then practicing the yo-yo, Nydresha fell, and in pain and frustration, cursed at another girl for dropping her. Her mother, watching in the Quitman basement next to Sarah’s mom, giggled. “I should’ve videotaped that,” she said. She took out her phone to be ready next time. During a break, Nydresha found herself torn between her coaches, who told the girls not to eat anything until practice was over so they wouldn’t get sick, and her mother, who brought chicken wings and instructed Nydresha to eat them. She did, even though she said the meat tasted funny. “My mom likes to get me in trouble,” Nydresha told me meekly, also apologizing for her cursing. Nydresha did keep going, and by the end of practice, she was getting through the routine without mistakes. Hay hugged her as they walked out. As the sun beat down in Newark on the morning of Saturday, June 7, hundreds of people congregated outside the locked doors of the Weequahic High School gymnasium, a gleaming three-year-old facility tucked behind a 1930s-era school building. Waiting to get inside were parents, relatives, teachers and other school staff, all there to support the 19 teams from all over Newark. When the doors finally opened at 12:15 p.m., it took more than an hour for everyone to pass through a metal detector and take a seat in the bleachers. Nydresha’s mother sat on the floor in front of the first row, at the feet of Nydresha’s father, who was there with her 2-year-old half-sister and her paternal uncle, who is Quitman’s head custodian. For Nydresha’s big day, her parents sat together like the family they once were. Nydresha adores her current stepmother and her “fairy godmother,” as she calls the mother of her two older half-siblings, but still sometimes wishes her parents were a couple again. The cheerleaders had been at Quitman late the night before getting their hair done by Sarah’s mom and one of the coaches. All but Nydresha had braided ponytails hanging down their backs. Her hair was tucked in a tight bun so it wouldn’t be in the way during the stunts. At 7 a.m., less than 12 hours after they had gone home, they were back to catch a bus to the tournament site, where they ate breakfast and did a trial run. Nydresha led the team in prayer that morning. In addition to asking God for victory, she said, she asked for all the girls to be kept safe, and for them not to fall on their hair. The teams sat in bleachers across from the audience in alphabetical order by school, which made Quitman 14th. The girls waited through three categories of cheers in the lower division, whose teams are comprised entirely of elementary school students, and through the A- to P-named schools in the upper division, where teams have girls of elementary and middle school age. Despite the modern building, the air conditioning was no match for this crowd, particularly up in the high rows of bleachers where they sat. And while about half the teams wore short-sleeve uniforms, the Quitman girls had royal blue and white dresses with mock turtlenecks and long sleeves. One year, the judges deducted points because they weren’t in proper attire, and although other teams risked that happening to be more comfortable, they would not take the chance. As the hours wore on, Nydresha’s mother brought her cookies and Gatorade from the concession stand. Finally, it was time. At 3:54 p.m., nearly 11 hours after Nydresha woke up to shower, they were on. The Quitman team had one of the largest fan sections in the crowd, just behind the panel of 10 judges. In addition to friends and relatives, staff members who came to show their support included Quitman’s testing coordinator and Nydresha’s English teacher, whose granddaughter is also on the cheerleading team. They stood up, shrieked and cried, “Let’s go, ladies!” Nydresha beamed. And then there she was, up in the air. High school cheerleaders stood ready as spotters should she go flying out of control. First came the basket toss, then cartwheels and backflips across the floor, then the spin, the pendulum, the liberty, the quarter-up, another basket toss and, at last, the yo-yo. She tucked her chin, somersaulted midair and landed on her feet. She had nailed them all. The team would have to wait another two hours and 20 minutes for the results, during which time Sarah competed in the upper division’s individual Miss Yell category, trying to defend her title. “But we’re going to place,” Sarah said, audibly tired. 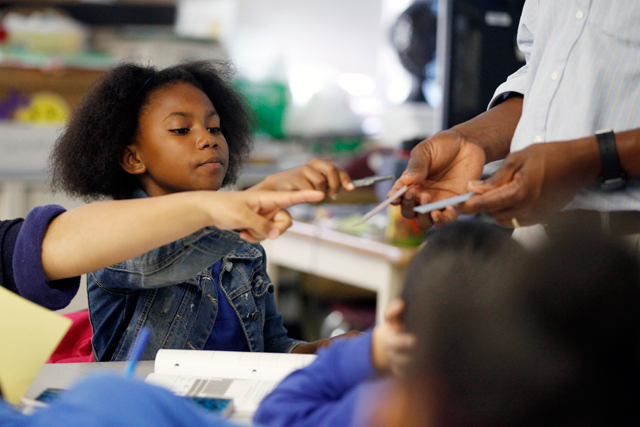 In 2012, Newark education officials set out to reform their city’s lowest-performing schools. 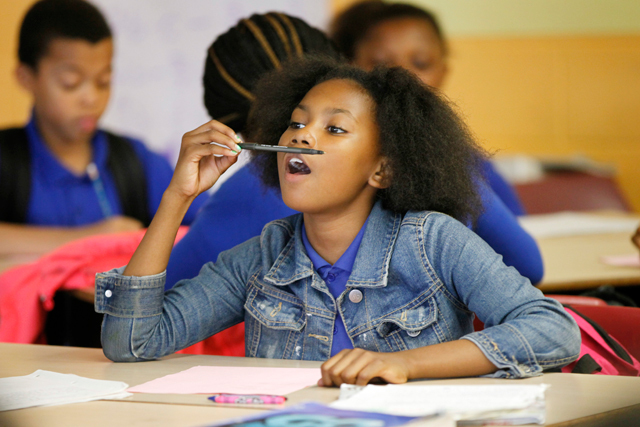 The Hechinger Report was granted extraordinary access to one of them, Quitman Street Renew School, to chronicle its successes and setbacks. Our ongoing series, which has won numerous journalism awards, goes behind the scenes as Principal Erskine Glover and his staff take on one of the hardest — and most important — jobs in the nation. Sarah ended up coming in second for Miss Yell. A Quitman fourth grader took fourth place in the lower division Miss Jump contest and second place in the lower division Miss Yell. A Quitman sixth grader tied with a girl from Wilson Avenue School for second place in the upper division Miss Jump. The upper division team results were the last ones announced, at 6:15 p.m. It was the moment everyone was waiting for — those who were still waiting, at least. About half the crowd had already left, including Nydresha’s dad, who had to pick up another of his daughters but would watch the announcement later on television. Third place went to Camden Street School. When Alexander Street — Quitman’s main rival — got second, everyone knew who was first. The Quitman cheerleaders and their supporters were already hugging, jumping and screaming when they were called as winners. “Girls, stop crying,” the tournament’s mistress of ceremonies said as the 14 of them in blue and white and their coaches ran down from the bleachers and gathered for the cameras. A few days later, each of them would receive a trophy at an awards banquet, but for now, for the photos, there was only one. It went to Nydresha, positioned front and center. In the weeks that followed, she would get distracted and fail to complete her final English project and have her hopes dashed of taking a summer vacation with her mom to see relatives in Georgia, a prospect she held onto after it became clear that they were not moving to Hawaii or anywhere else. (“I could fit in people’s luggage,” she offered.) She would toy with the ideas of spending more days of the week with her dad and of transferring to a charter school, and ultimately nothing would change and she would settle into the routine of summer school and cheerleading practice, with the hopes of another trip to Florida come winter. But for now, if just for a moment, the spotlight was hers. And wherever life takes her, she will remember how it feels to work hard and come out on top.